You will fall in love with the breathtaking views from this GULF FRONT CORNER UNIT on the 7th floor of Westwind. Westwind is a low density condominium with only 30 units located on the emerald coast of Gulf Shores, Alabama. All units are gulf side, and with only 30 units you avoid the crowds and long waits for an elevator. Relax in the Gulf Front pool or enjoy the spectacular white sand beach where beach chairs and umbrella rentals are seasonally available. The spacious master bedroom has a king sized bed and furniture installed 8/14, flat screen TV, and private bath. The master bedroom offers views of the Gulf and Lagoon. The second bedroom has a side gulf view and a queen bed, TV and DVD. Kids love the built in bunks in the hall. A sleeper sofa in the living room offers extra accommodations. The living area also has 2 power recliners, flat screen TV with DVD, and a full size dining table. Balcony is tiled with a dining table and tall chairs. We strive to keep our furnishings current and comfortable. During June and July, we only rent full weeks from Saturday to Saturday. This condo is right on the beach. No neeed to worry about how far to walk. Unobstructed gulf front view from the living room and balcony. Parking passes are $15 and available for up to 2 vehicles. Balcony has table and chairs with a spectacular view. Adorable condo on the coast, with comfy beds and lots of comforts. The location was great, and we really enjoyed ourselves, and our walks on the squeaky sand. Enjoyed our time at Gulf Shores and look forward to coming back. Enjoyed the spectacular views from the balcony! Just Right! Great Condo, Great Weather, Great Trip! We absolutely loved our first trip to Gulf Shores! Alicia is definitely an owner who prides herself on her guests having a worry free stay and is so easy and nice to work with! To start with, we tried to book this condo much earlier, but she contacted me to say that she thought the elevator in her building would be undergoing repairs when we were there, and didn't want us to have to walk 7 flights of steps over and over, so she declined our request to book! How stand up is that? Then, after searching for a week or two and not finding what we wanted, she messaged me back to let me know the repairs would be starting after our dates and asked if we were still looking for a place! We booked it immediately. Simply put, we had a great time on our first of many trips to the Gulf Shores area, and it was made that way because of a great owner who truly cared about our experience! Thanks Alicia! Wow! Thank you for the kind words! Everyone works hard and deserves a worry free vacation! Booking a condo should be the least of your worries. We hope y’all will stay with us again! Condo was located in close distance to all main attraction. Very clean and short distance to beach and pool. With a 2 year old that meant a lot because of all the items that had to be carried. Owner was in contact with us to make sure we didn't need anything, very personable, which we liked. Will definately be booking this condo in future. So glad y’all enjoyed the condo! Please stay with us again soon! Perfect condo and perfect views!!! This condo was very nice. I took my 2 kids and my mother for Labor Day weekend. We were not disappointed!!! It was clean and spacious and exactly as advertised. Actually was even bigger than I thought! Huge condo compared to others I’ve stayed in. Even though the complex was full, it was still quiet in the condo. We never heard anyone. The condo spans the entire width of the building. The master overlooks the parking lot/hwy side. The 2nd bedroom and kitchen and living have windows out to the side of the building and the balcony off the living overlooks the Gulf. Nice natural light in all the rooms. The balcony is huge with beautiful views.. since it’s a corner balcony you can see the beautiful beach right there in front of you and all the way down the beach! It was wonderful! The balcony was our favorite place. All the furniture in the unit is updated and comfy. TVs in living room and both bedrooms. That was nice bc my son was happy he could hook up his gaming system in a bedroom and play some while the rest of us hung out in the living room. And the hallway bunk beds were great for the kids....kept us from having to Book a 3 bedroom and allowed us to save more $$$ for fun stuff. Kitchen was great too. We cooked breakfast daily. 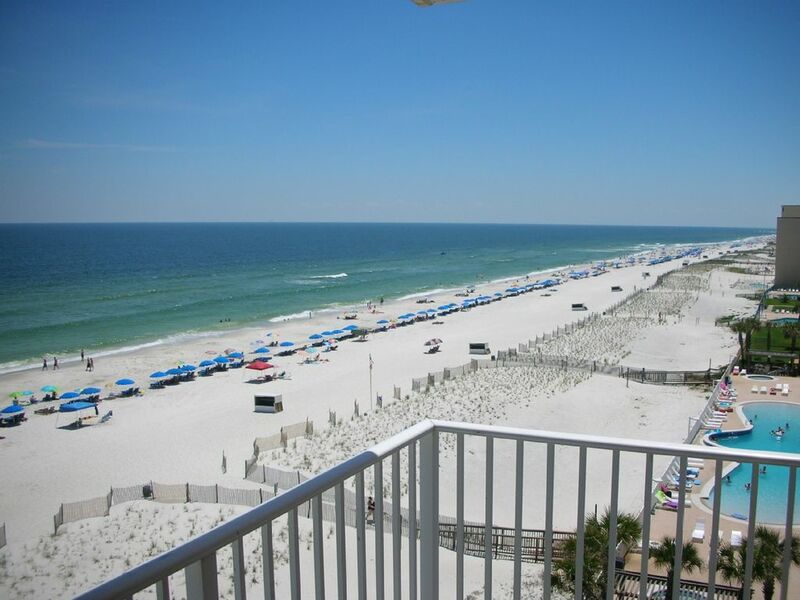 The location of the complex is convenient to everything in Gulf Shores. The owner is very responsive too. We chit chatted a little back and forth bc I constantly have questions (late arrival, 2 vehicles, etc) and she always got back with me very quickly. This condo was amazing and perfect for a large family , small family, or even a romantic getaway! Choose this one if you are trying to decide! You will not be sorry! We loved it and will stay again!! Thank you for the great review! We are glad the condo exceeded your expectations! Please come again soon! Condo was great, view from balcony fantastic, beach wonderful, Gulf Shores Great. Had a great time. Balcony and Condo were great. First time staying on a higher floor and we really enjoyed it. This area is known for stunning white sand beaches. Several Marinas are close by offering sensational deep sea fishing as well as inshore fishing. Golf enthusiast will enjoy nearby Craft Farms.